Every day I walked past the Porsche dealer on my way to work. I would often stop and look at what they had on the showroom floor. 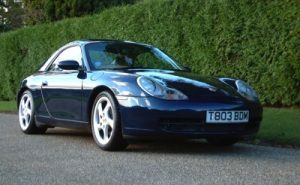 One day I saw a blue 1999 911 Carrera 4 (996) with a detachable hardtop. It was a beautiful Spring morning, and a man had to have a convertible. What got me going with this car was that they had just changed the lights from the ubiquitous bug eyed (993) headlights to the new tear-drop (996) shape. 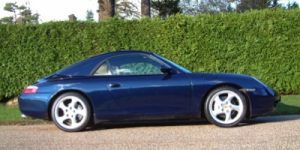 They also introduced water cooling for the first time, and from my point of view, created a much prettier car than the out going 993 model (Porsche enthusiasts hated the 996, so a couple of years later they changed back to the bug eyes). The lights also made the coefficient of drag a respectable 0.30. The 320 hp 3.6 L made this car faster than the heavier 850, so I was happy. Another car I really liked then was the new Maserati 3200 GT. Somebody had one near my office and I would often stop and try to see myself driving one. It had a 370 hp twin turbo V8 and was designed by Giugiaro, the same guy who did the Maserati Merak, Bora, Ghilbi, BMW M1, and a lot of others. On paper this sounded fantastic, but I had learned never to buy the first year of any car, much less a Maserati. The Porsche dealer was a couple of blocks from my apartment and also the office, and servicing would be easy. Besides the Irish saleslady had incredible green eyes. Need I say more? I traded my 850 for a C4. The first thing I did was to try to get personalized plates. I managed to get a plate that read “C4 YES”. 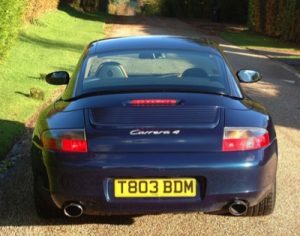 The intention was to answer the question, “Is that a Carrera 4?” Nobody ever asked me, so maybe it wasn’t obvious. This car was easier to drive than my 850. It felt agile and quick. With 4 wheel drive I hoped to avoid the embarrassing spin outs that plagued my earlier rear engine cars. I had wide tires and power to all 4 wheels, so I felt comfortable pushing it. I loved the car. I drove it throughout England, Scotland and Wales for a year or two. The only thing I found difficult was taking off the hard top. It was a two man job. When December came my children’s school had a School Skiing trip planned to Porte du Soleil in Torgon, Switzerland, and I volunteered to chaperone. The only condition I had, was that I would drive my car to Switzerland, instead of the customary school bus. This was going to be a real bonding experience with my youngest son, Lucas. Soon I realised we had a problem. The 4 wheel drive did not help at all. The wide tires were hydroplaning on the snow and wouldn’t steer. The road had about 20 switchback corners, and no guard rails. 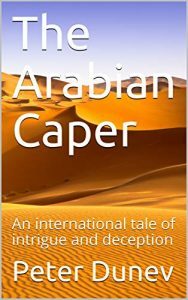 Every single turn had to be negotiated very carefully, as the C4 would slide from side to side and I thought that every turn would be our last. The road was too narrow to turn back and when the car stopped it would start sliding by itself. I had to keep a minimum speed (5-10 kph) to try to keep the road in front of me, and enter each turn as if we were on a hovercraft, with our fingers crossed. Since I am writing this, it is obvious we didn’t kill ourselves, but that hour was the scariest I’ve had in a car. When we arrived at the hotel, I was drenched in sweat. My son was a champ and never complained, although I remember seeing alarm in his eyes as we negotiated the mountain. Other than another chaperone breaking his leg, the trip was eventful. The powder was sublime, and we found endless untracked slopes. A week later, when it was time to return, the road had been plowed and we went down in about 20 minutes, instead of over an hour it took to get up. Once we got back into France, the roads were dry and we could average 200+ kph the entire way back to the ferry. I kept this car until it was time to move again. This time back to the States.